Participants in the Cornwall Workshop arrived in Kestle Barton, the arts centre near Helford which is hosting the workshop, on Friday evening, and attended a keynote talk by Hamish Fulton at Falmouth College. 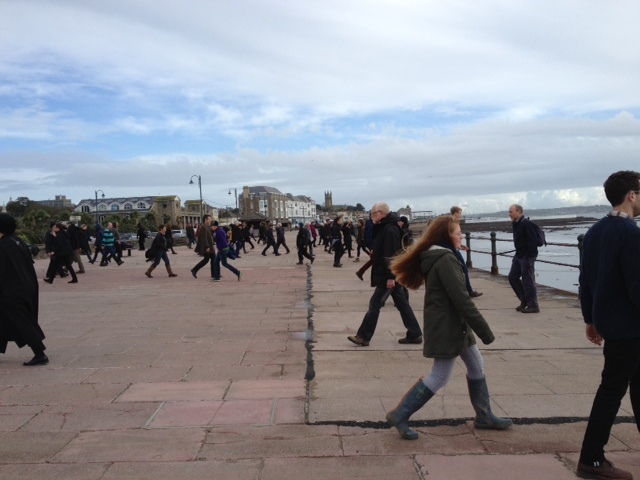 On Saturday, we took part in one of Fulton’s walks on the Western Promenade in Penzance. The promenade is paved with large slabs of sandstone, arranged in lines perpendicular to the coastline. 104 people took part in the walk, which consisted of each participant walking up and down one line of paving slabs. Walking to the sea, and away from the sea, to the sea, and away. Fulton was keen that we shouldn’t stop when we reached the end of our strip, but that we incorporate the turn as part of our walk and not break our pace. We were lined up in such a way that adjacent lines set off from opposite ends of the pavement, so that we began by walking towards each other, but very soon individual rhythms took over and the neatness of the group’s synchronised movement gave way to syncopation. We started at 11 o’clock sharp, by our own time devices, and stopped at noon. The walk took place in silence and Fulton requested that anyone starting the walk should finish it. There was some discussion before the walk about how we might deal with the repetitive nature of the action, how quickly or slowly time might pass, and – of course – the threat of rain. In the event, it did not rain on this walk; in fact, it got warm enough for people to remove their coats and hastily dump them on the ground at one end of their strip. This walk is now one of Fulton’s works, logged in the list of private and public walks he has made all over the world. It may or may not result in a photograph, text piece, or mural, which are the formats Fulton uses to produce material works, through which people who weren’t present at the walk can encounter them. The first ten minutes seemed the longest. Then the intervals at which I checked my watch lengthened until I missed the 12 o’clock finish by a few seconds. I became acutely aware of my senses during the walk, and at one moment in particular, it was as though I was suddenly seeing in colour. I noticed that I was wearing a purple sweater, that the woman walking towards me on the left was clothed in purple from head to toe and had bunched her purple raincoat on the wall at the end of the pavement. I saw a huskie wearing a muzzle being walked by a curious man, I saw a man digging holes on the beach, backlit by sublime sunlight, and I tasted my toothpaste again and again. I walked to the sea and back towards The Tides restaurant. A woman appeared in the attic window, picked up her smart phone and took pictures of the group. The light on the façade of the building reminded me of an Edward Hopper painting. Later, when participants in the walk shared their experiences, it was striking how many people commented on the strong social nature of the walk. It was fascinating to look down the line of walkers and notice the variety of movement, facial expressions, clothing and walking speeds. Fulton had encouraged people to start at their own pace, and to walk the hour without speeding up or slowing down. One woman completed just one crossing of the 15-metre wide pavement. She had timed herself so perfectly that she arrived at the sea at 12 noon. She moved in slow motion with extreme muscle control and apparent mental steadiness. Some seemed to be racing to nowhere, while others ambled the short distance before turning back without any visible sense of urgency. People walking at different speeds occasionally lined up and then fell out of synch, a phenomenon that brought to mind Steve Reich’s early phasing works from the 1960s, in which recorded elements or live players start out synchronised and then change tempo, playing until their cycles return to the same beginning and start again. This incident made me wonder about the exclusivity of the situation and whether the walk was by default alienating to those not taking part. Should there have been posters explaining the walk? More stewards handling questions? Were we occupying a public space that belongs by rights to the locals or were we too legitimate users of the public space? How was the walk being perceived by those watching: as an elegant coming together of people pursuing the same goal, or as a privileged group of people in the know taking over the people’s space? I was on the walk with you. I wrote notes … brief comments… from just before to just after. Here they are. walkers unite.if you need the loo go now, and officials ahead and behind like a school trip. follow the leader.walkers take precedence on roads, the power of collective action.the promenade is seaweed strewn but today the spray stays below the wall. dogwalkerscontinue their walk along the sea edge as we line on either side, rogue elements.the lady looks down from her room or flatin “tides”, does she know , she must guess. close to tears, a sense of power, unity in our separateness, freedom and rules.repetition,turnfrom sea to houses on the front. time to watch the tide come in.like church, a meditation, the hushbefore the service, wavesong. my footprints repeated,overlatered on the smooth pink concrete,they dry and more are made.the black lines of the railings become significant, i start to notice lines. i see two walkers in adjacent lines walk together- a sense of wrongness until I realise their different paces give a temporary coordination.laughter, the soft scratch of moving waterproofs, the purr of cars, and the sea, the sea, the sea.when i follow any path it is people with whom i share my journey- even when i walk alone.my shadow walks on someone else’s lane, and mine is invaded by my neighbour’s sillouette. discarded coats collect along the land-side wall, our behaviour determined by our environment. so much more aware of the cross-currents, the non-conformists who cycle , skate-board, push prams against the flow- not understanding our shared rules. young skateboarders start to play and weave between our slowly forming patterns and barriers. the promenade a barrier between sea and land, the walkers a barrier to free-flow of traffic on the promenade. together/ a party, apart/isolated. counter-culture, visa-versa, pushme-pullyou, too-fro. appartments overlooking the walk, apart again. proud to be in on the secret, to be a part. and could i wear some stone away? would ridges form like ripples in the sand? my straight path has a kink in it, a black line marks an extension- an improvement? did gardens once bloom here? the camera men compare their shots, separate yet involved through observation, the cyclists separate but involved with the moveable immoveable object. to get to the other side.walk to walk, to share a destination, noon?, it could be maturity, a good age to die.the path of least resistance, the road less travelled. order, disorder,order. my path, my cracks and irregularities, ownership by use or familiarity, i am cornish. ownership by action, i am a walker, i am an artist, i am alive. i own my life. ownership feels like the wrong word, too aggresive, precluding sharing, excluding others, and yet by sharing the walk with some do we exclude others? the rules of the Helston furry dance, uniting a town and excluding visitors with heirarchies and traditions and snobbery and pure boisterous JOY. i watched a funeral in italy, the coffin carried high as mourners came from the houses as it passed to walk slowly, silently behind until it reached the church. This entry was posted on October 20, 2013 by ellendw.